Today I got to be the mom I’m not. With two doctor appointments on the calendar, I didn’t go to work. Today I woke up after you and just in time to see a beautiful sunrise. Today I made your peanut butter sandwich in my pajamas while I drank my coffee and you ate your breakfast. You talked and I listened. Today I waited in traffic and dropped you off in front of the school. I hollered, “Have a good day! See you after school! Love you!” as you walked away. And then I got to do the same with your brother two hours later. Today I ran errands between my appointments in my gray cardigan and my gray Converse. Today I listened to my favorite songs in the car. Today I ate a hot lunch at the kitchen table and read a magazine just for fun. Today I did the laundry and folded it and put it all away. Today I not only thought about it, but made dinner (and Jell-O!) before school was even out for the day. Today I picked up your brother from school without feeling exhausted and longing for a few moments to myself. Today I watched you practice with the marching band. Today I helped with homework and listened to stories about school. Today I got you to the high school on time (even a little early) for your choir concert. Today I put you both to bed, tired, but happy, and thankful for the day. 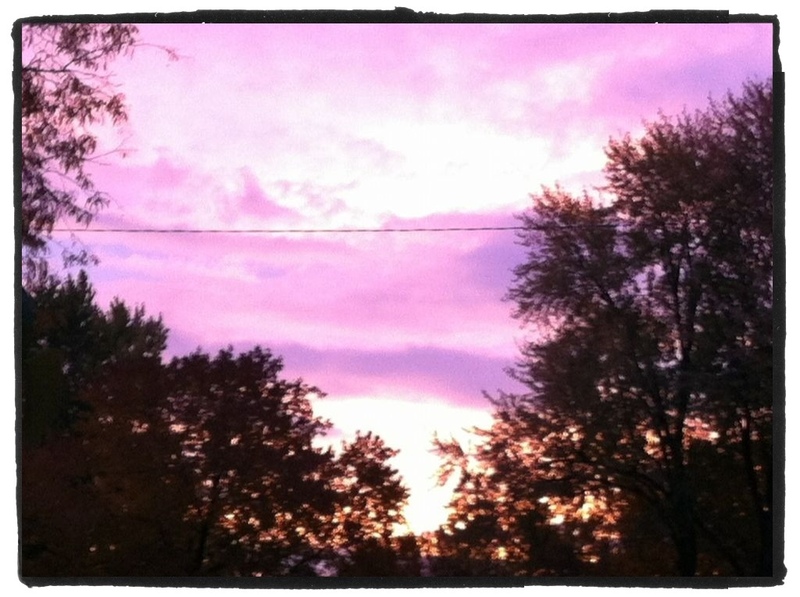 The amazing sunrise I saw today – snapped on my iPhone. Tomorrow I go back to being the mom I always am. Tomorrow I will rise and shine at 5:30 a.m. and wake up two groggy kids. Tomorrow I will iron clothes with my eyes half-shut and wear shoes that I’ll probably regret later in the day. Tomorrow I will flip through stations on the radio until I find a song you both love. Tomorrow we will go in the back door of the school when it’s still dark and walk down the empty hallways. Tomorrow we will eat breakfast in my classroom while I shuffle through papers and prepare for 1st period. You will talk and I will do my best to listen. Tomorrow I will eat my salad and apple at my desk grading papers, replying to emails, checking Facebook, and reading my favorite blogs all in 40 minutes. Tomorrow I will clean up my classroom and try to get lesson plans together while you tell me about your day and I will do my best to listen. Tomorrow I will need to stop at the store after school and pick something up for dinner. Tomorrow I will help you frantically look for the shirt you can’t find, but must wear, before we go to the football game. Tomorrow I will sit with your brother and watch the football game. I will listen to him talk about football for three hours straight and I will be happy. Especially because I am just sitting down. Tomorrow I will put you both to bed, tired, but happy, and thankful for the day. this speaks directly to my feelings about returning to teaching in Jan. after having my first little one… i am excited because i miss teaching so much! but i am so worried and i already have a tinge of regret because i know i’m going to miss a lot— a lot of him, a lot of my husband, and as you pointed out… a lot of myself as well. Thanks for reblogging my post. I am so glad that you could relate to the feelings I expressed. Always remember to take care of you….you’ll be a better teacher, wife, and mother. Going back to work is definitely a hard thing to prepare for/think about….especially with your first. Best advice I can give you…Don’t spend your days counting down…spend your days making them count. Wonderfully written and oh, so true. Thank you! How old are you kids? It gets harder and harder as they get older and more active! What a wonderful post. It speaks to why we have to live for TODAY. Been there and done that. Very well said. I am sure you found that as the kids got older it got even crazier. Am I right??? Is this just the beginning???? I’m tired already! You just made me cry!!!!!! Ugh! To work is awesome/ to be a mom is awesome— sometimes, they still do not compliment each other. I am so happy for you to have your today! I relish those moments, too! Thank you Cheryl! It’s definitely hard to find a balance but I try to make it work because that’s my life. Both make me happy…being so busy and needed at work and at home. This week has been a blur…I am exhausted and calling it a night so I can get to tomorrow…..FRIDAY! !